The purpose of this article is to guide first time users of Maxim Integrated’s Thermochron/Hygrochron iButtons through configuring (missioning) and downloading logger data with 1-Wire Viewer. This article assumes the installation of the 1-Wire Viewer software has been completed. If this is not the case, the latest version of the software may be downloaded at http://short.eds.bz/OneWireViewer. Plug the DS9490R# USB adapter into the PC. Windows should detect the “New Hardware” and install the USB drivers if it has not been completed previously. Then plug the DS1402 cable’s RJ11 (phone) plug into the USB adapter. 1-Wire Net Port Selection – Select the “DS9490 USB” device option and then select port number “1”. 1-Wire Search Mode – Select “Normal” devices. Section A – Includes each connected iButton's serial number and part number. The USB adapter with a serial number ending in “81” should always be listed on the devices list. Section B – Includes tabs for navigating to an iButton's settings. Plug the Thermochron or Hygrochron iButton into the DS1402 cable. 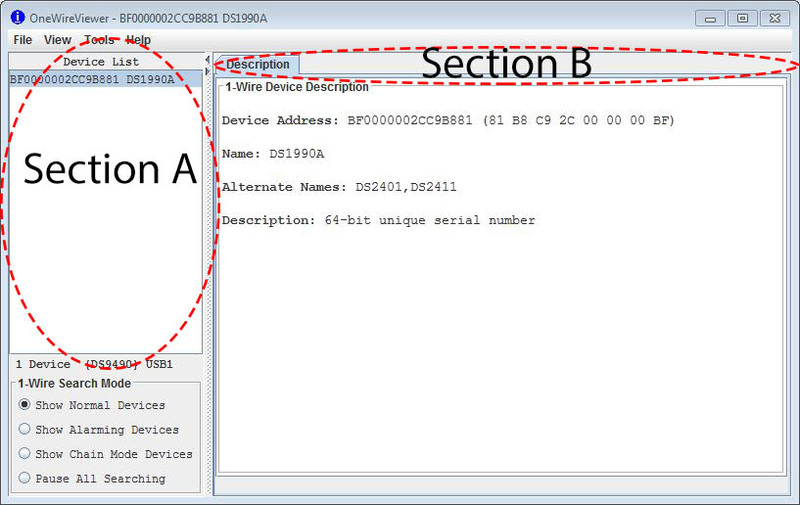 Within a few seconds, the unit should be added to the device list, section A. Click on the unit’s serial number. Section B should now be populated with many additional tabs. Select the far right tab which should now read “Thermochron” (DS1921 models) or “Mission” (DS1922 and DS1923 models). Section C – Includes the Refresh, Start, & Disable Mission buttons. Fahrenheit and/or Celsius can be selected as the unit of measurement. Section D – Includes tabs for viewing mission status and recorded data. Click the “Start New Mission” button, this will open a new window named “Initialize New Mission”-- mission parameters are set here. Synchronize Clock - It is recommended to synchronize the Real-time clock with your PC. Please note OneWireViewer does not track time zones; therefore, mission data is recorded in the time zone in which the iButton was last synced. Enable Rollover - This feature configures the iButton to overwrite the oldest data readings once its memory becomes full. Mission Start Delay - The “Mission Start Delay” will indicate the duration (in minutes) until the logger begins to record data. High and low temperature alarms can be set to trigger at user defined temperatures -- these can later be viewed on a graph or Excel spreadsheet. The Clock Alarm feature is irrelevant for iButtons with enabled missions. Mission data can be overwritten if a mission is not halted. If the rollover feature is enabled and the logger's memory becomes full, the mission's reads will start being overwritten. It improves the Thermochron's battery life1. Thermochron missions if not disabled continue to consume power. This unnecessary depletion of the battery life shortens the logger's life expectancy. Once a battery is depleted the logger's readings are cleared from the memory. Histogram and alarm data continues to be calculated when a mission is not halted. These calculations drain battery life and also clutter your mission data with irrelevant/unnecessary data. The most updated data is freshly generated when the “Thermochron” tab is selected upon initial contact with the iButton. In instances where live monitoring of the “Status” and “Temperatures” tabs is being done, clicking the “Refresh Mission Result” will provide the most recent data. From the "Thermochron" tab located in Section B, you can select the “Temperatures”, "Histogram", and/or "Alarm Log" tab(s) in Section D to view the mission data. From the "Temperatures" tab you may export the logger data by right clicking on the graph. This provides you with a number of export options and the ability to rescale the graph. Our suggested export method is “save data to .csv file”. You will be prompted with a name for the CSV file which you may change as desired. The CSV file format should allow the temperature data to be analyzed and graphed with a variety of applications including Excel. This includes the same basic sections as the DS1921, but there are a few minor differences. Section C will also include the ability to select whether the humidity data is temperature compensated and whether the Saturation drift is limited to 100%RH. This is in addition to the Refresh/Start/Disable Mission buttons and the Fahrenheit/Celsius selection. Section D for the DS1922 is limited to the "Status" and "Temperature Data Log". Click the “Start New Mission” button in Section C. It will open a new window named “Initialize New Mission”-- mission parameters are set here. DS1923 models do not require alarms to be set for humidity logging. Enable Sampling Temperature – Enable sampling must be selected in order for a mission to start in the DS1922 models. It is optional to leave this un-checked in the DS1923 model if the humidity “Enable Sampling” is active. This could be useful in situations where extending the time between downloads is necessary. This is accomplished by configuring a DS1923 to only log humidity data and partnering it with a DS1922L recording the temperature data. Start Delay - The “Start Delay” will indicate the duration (in minutes) until the logger begins to record data. Resolution – Select your desired resolution, the blue highlight will indicate the resolution selected. A higher resolution provides greater detail to the reading at the expense of the number of readings stored. Enable SUTA – SUTA stands for “Start Upon Temperature Alarm.” This feature is activated once a predetermined temperature alarm has been reached. The logger can be programmed to take temperature readings, but only begin recording the data once an alarm has occurred. 1-Second Mission Test – This feature is no longer needed for models with date codes newer than 04/2007. When checked, a one second mission test will occur -- once completed, the mission will start with the original user defined parameters. Like the DS1921 models, the "Refresh Mission" button triggers the 1-Wire Viewer software to download the logger's data again. This is generally useful for people testing the logger/software functionality. From the "Mission" tab located in Section B, select the “Temperature Data Log” tab in Section D this will display a graph of the mission data. The data can be downloaded from the logger data by right clicking on the graph. This provides you with a number of export options and the ability to rescale the graph. Our suggested export method is “save data to .csv file”. You will be prompted with a name for the CSV file which you may change as desired. The CSV file format should allow the temperature data to be analyzed and graphed with a variety of applications including Excel. 1. Battery performance can be further maximized by turning off/halting the clock after a mission has ended. To accomplish this, go to the "Clock" tab in Section B and click the "Halt Real-Time Clock" button.